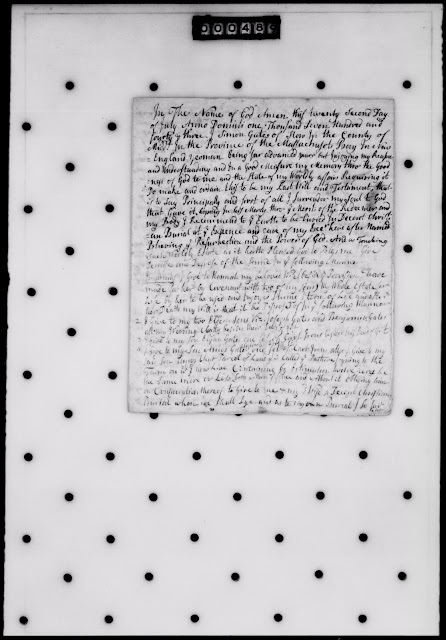 Genea-Musings: Amanuensis Monday - 1743 Will of Simon Gates (1667-1752) of Stow, Mass. Amanuensis Monday - 1743 Will of Simon Gates (1667-1752) of Stow, Mass. devise and dispose of the same in ye following manner. her death my will is that it be disposed of in ye following manner. all my wearing cloaths besides their deeds of gift. 3. I give to my son Elisha Gates one set of cast irons besides his deed of gift. all of my grand children as much as one of my said daughters. my two eldest sons viz. 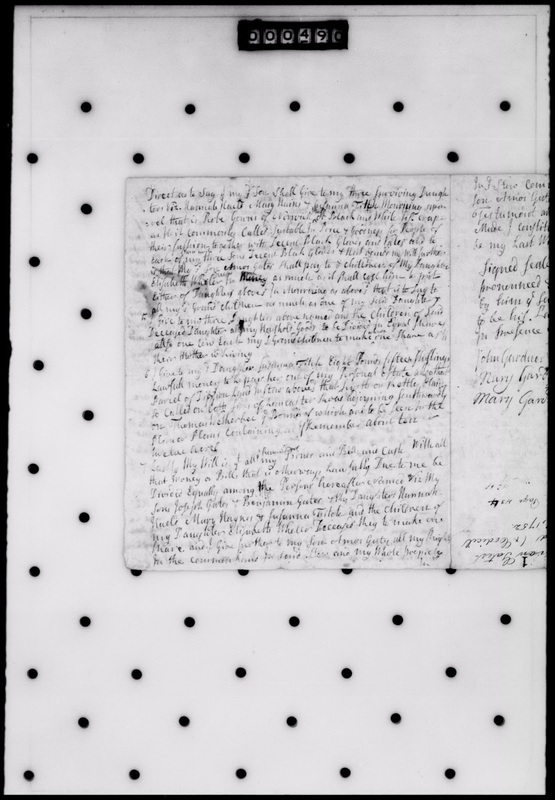 "Middlesex County, MA: Probate Papers, 1648-1871," digital image, American Ancestors (http://www.AmericanAncestors.org : accessed 26 November 2015), Probate Packet 8,994 (10 images), Simon Gates of Stow, 1752. On 22 June 1752, the will was proved, and Amos Gates was directed to exhibit an inventory of the estate of the deceased according to law. On the same day, Deliverance Brown, Samuel Gates and Joseph Brown, all of Stow, were appointed and empowered to take the inventory of the estate of Mr. Simon Gates, late of Stow. 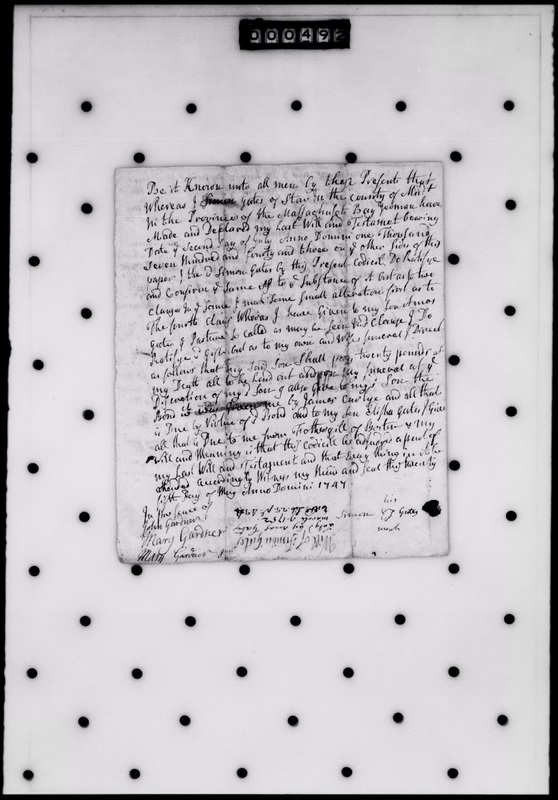 The inventory of the estate of Simon Gates was presented by Amos Gates to the three appraisers on 10 January 1753. The land that was given to Susannah Fitch was appraised at 72 pounds, the pasture and land adjoining to the farm that was given to Amos Gates was appraised at 100 pounds, money and bonds and notes were appraised at 215 pounds, 6 shillings, 1 pence, a cow was appraised at 20 pounds, and various and sundry items of furniture, kitchen ware, household goods, wearing apparel, etc. was listed. A total was not written down. Amos Gates exhibited the inventory on oath to the court on 5 May 1755, and it was accepted by the court. There was no distribution document included in the probate record. There are several words that are difficult to read in the will and codicil due to the handwriting and my inability to decipher what they are. A search for Middlesex County probate records for Hannah (Benjamin) Gates did not find a definite probate packet. 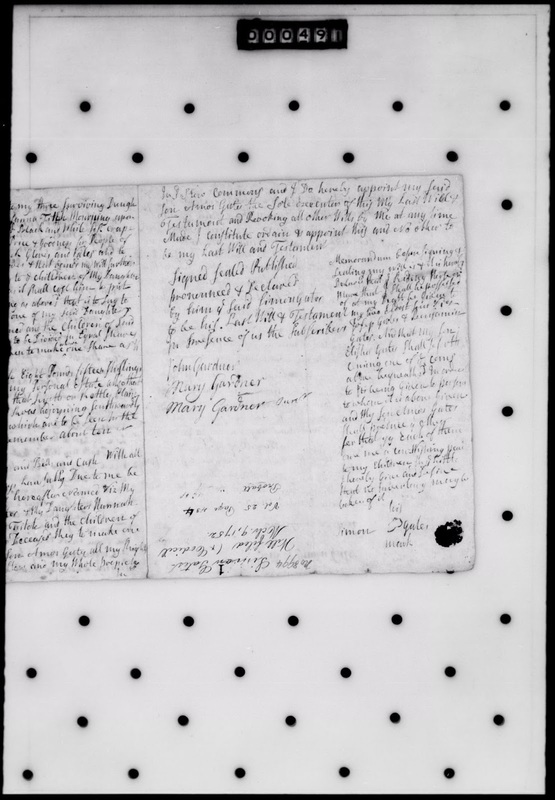 There is Packet 8,957 for Hannah Gates of Framingham in 1763, with an administrator named Amos Gates, but the married daughters last names did not match the known last names of Hannah (Benjamin) Gates' daughters. There was an Amos Gates residing in Framingham in the 1760 to 1780 time period, and there are land records for him, but he is not Amos Gates (1706-1783), son of Simon and Hannah (Benjamin) Gates. Simon Gates (1667-1752) and his wife, Hannah Benjamin (1669-after 1752), are my 7th great-grandparents, through their son Amos Gates.